The Army Black Knights took on VMI in Michie Stadium at the United States Military Academy in West Point, NY on Saturday, October 30, 2010. Army defeated VMI 29-7. Army's Donovan Travis (6) intercepted a pass and rushes for yardage against VMI in the fourth quarter of their game in Michie Stadium at the United States Military Academy in West Point, NY on Saturday, October 30, 2010. 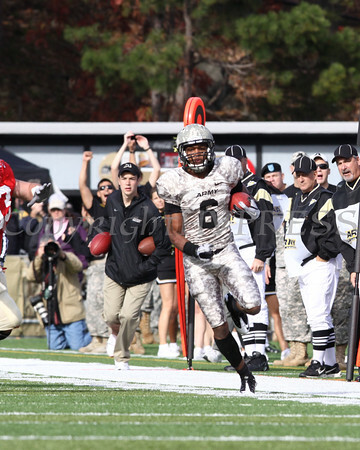 Army defeated VMI 29-7. Hudson Valley Press/CHUCK STEWART, JR.